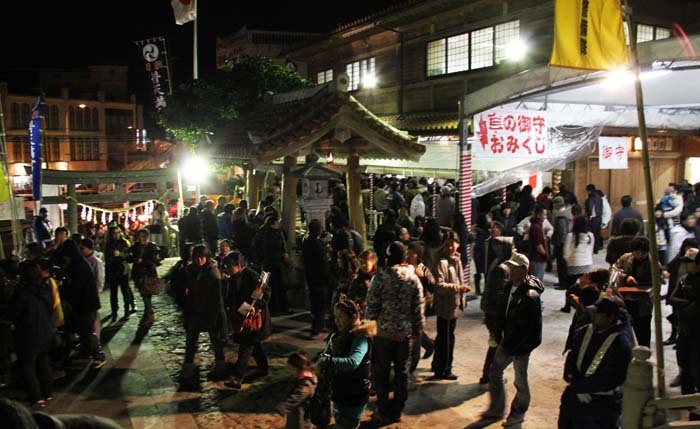 Crowds wait for the midnight in front of the Futenma Shrine on Dec. 31st. 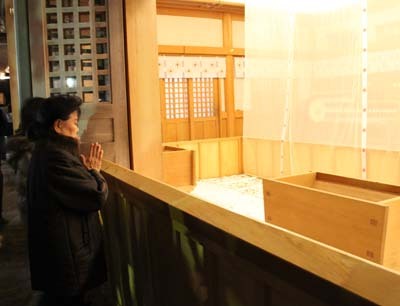 A woman prays at a shrine after throwing coins into the wooden saisen-bako offering box in front of her. The first question a foreigner often asks is, “What’s the difference between a shrine and temple?” Many visitors to Japan can’t tell the difference, and they often use the terms interchangeably, but it would be about the same as using the terms church and synagogue interchangeably. Two primary religions are practiced in Japan, Shinto, which is practiced at a shrine, and Buddhism, which is practiced at a temple. Both religions date back thousands of years. The Shinto religion is a spiritual ideology that began back in the feudal days of Japan and is based on the belief that powerful deities called kami, or gods, inhabit both heaven and earth. Among the populace, each clan identified with its own kami and utilized a shaman or diviner to help them pray, and often built shrines dedicated to their chosen kami. A group of young women getting ready to wash their hands at the Futenma Shrine chozubachi before praying. The Shinto religion was unified in the 700’s when the mythology was documented for the first time to include the various kami formerly worshipped by the individual clans. The Japanese refer to Shinto as kami no michi, the way of the gods, but the pronunciation of the Chinese ideographs for the words is shin tao, thus Shinto. Buddhism was introduced to Japan from China and Korea in the sixth century, and gained wide acceptance in the following century when it was endorsed by the nobility. The Japanese word for Buddhism is bukkyō, which is a combination of two words: butsu meaning Buddha and kyō meaning doctrine. 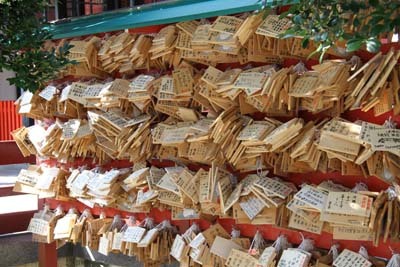 Ema prayer plaques are hung on a speacial wall at the Naminoue Shrine. Most people in Japan practice both faiths and there are no restrictions of doing so. Shinto tends to be viewed as the religion of earthly matters and shrines are often used to host weddings and are where one would go to pray for success in life or business. On the other hand, Buddhism is considered the religion of spiritual matters, and temples usually host funerals and are where you would go to pray for your ancestors. There are a few rules everyone should observe when visiting a shrine or temple. 1) Prepare yourself. Before leaving your home to the shrine, make an effort to bathe, or at least wash your hands and face. Cleanliness is vital in Shinto. 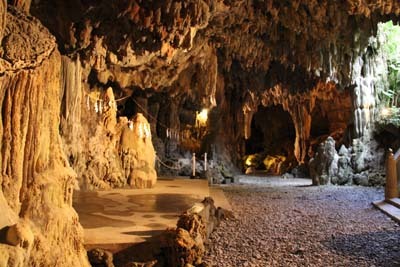 Futenma Shrine is built around a cave. 2) Making a polite bow before entering the shrine under the torii gate. Often there will be a long pathway lined with toro lanterns. After making a bow right under the Torii, follow along the path. 3) Purify yourself. Stop once you reach the chozubachi, the water basin. 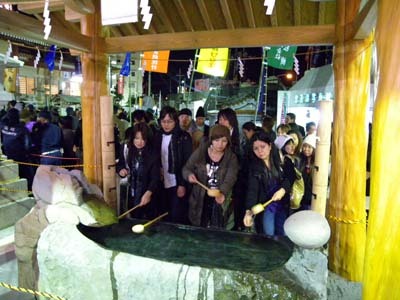 Over the chozubachi, take the wooden dipper in your right hand and fill it with water. Pour the water over your left hand. Then take the dipper in your left and pour water over your right. Third, pour some water from the dipper into the cupped palm of your left hand. Rinse your mouth with this water, spitting it back out into the palm of your hand. You can dry your hands with a handkerchief, if you like. 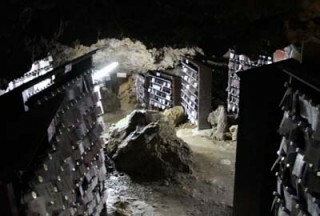 4) Proceed to the main part of the shrine. Do not to stand in the center before a shrine if possible, and bow small. If someone is already there, wait patiently at the bottom of the stair for them to finish. Depending on how large the shrine is, it may be permissible for two or more people to worship at the shrine at the same time. 5) Worship. Climb the stair. Throw your coin, usually a ¥5 or ¥10 coin, into the Saisen-bako, the offerings box. Then ring the suzu, the bell, firmly a couple times. Take a step back, bow twice, then clap twice. Spend a few moments in prayer, if you like. Then bow only once again. 6) Finish! Proceed back down the stairs. At this time, you can perhaps purchase an omamori or amulet, hang an ema, a prayer plaque, or partake in any special event the shrine might be holding. There are some customs you need to follow when at a temple. Washing hands, donating money and checking out your luck are a few of them. Compared with Shinto, Buddhism doesn’t have complicated worshipping procedures. Kin Shrine also has a cave under it. On the main Okinawa island, there are eight shrines, which received special treatment from the Ryukyu Kingdom, the government before the Meiji era. These are Naminoue shrine, Oki shrine, Shikina shrine, Futenma shrine, Sueyoshi shrine, Asato Hachiman shrine, Ameku shrine, and Kin shrine. Yahata Kami is deified only in Asato Hachiman shrine, while Kumano Kami is deified in all others. 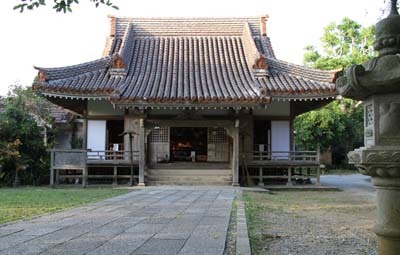 Naminoue shrine, Oki shrine, and Futenma shrine are most popular shrines to worship. Naminoue Shrine in Naha is the most popular site for people to visit during the New Year. 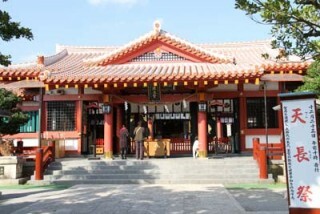 9:00~18:00 (Jan4~) Naminoue shrine is located on a cliff overlooking Naha Port, and is often called “Nanminsan”. This shrine has most visitors during the New Year holidays. Hatsumode at Oki shrine features the New Year Eve Festival, in which a Shinto priest raises a congratulatory address before 0:00, and strikes a drum 108 times, and the New Year Day Festival with prayers for the new year. Many persons from around the island visit especially to pray for traffic safety on the 3rd. 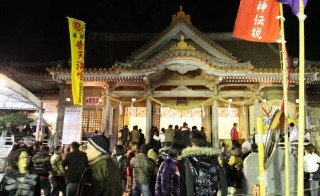 Futenma Shrine always has large crowds during the New Year. Gokoku temple is part of Koyasan Shingon Mission in Naha City. This is the head temple of the Shingon in Ryukyu. It’s the oldest temple among the temples existing on Okinawa. This temple is a favorite spot to pray for traffic safety with many people even bringing their new cars here for purification. It was founded as the end temple of the Narita-san in 1975. Original Narita-san is the Naritasan Shinsho temple in Narita City, Chiba, which is the head temple of the Chisan Branch of Shingon. The first sun of the New Year Day rises from Pacific Ocean. In order to greet the first sunrise of the year, many worshippers pass time in the precincts of the temple from midnight. The atmosphere is very solemn at the moment of the sunrise on the New Year Day.